Yes I am going to take vacations! It has been a while (after May 2005) when we went out from our current address in Paris. In our standard of travelling it is a record for good or bad...that can't be said. May be it is the effect of Chateau, Bateau, Gateau.We would love to visit some country-side or mountains now. But, unfortunately Pamela is not at all interested for any ski-trip as she is complaining about the Paris cold all the time. So no trip in Europe for now. Well, this vacation I am cheering but may be it will be just like another trip to India where my days are more hectic with relatives and long journeys and at the end I question myself was it a vacation or my social duties. For sure I am going to travel a lot as I will start my trip of India with Delhi and ending the same in Bombay. 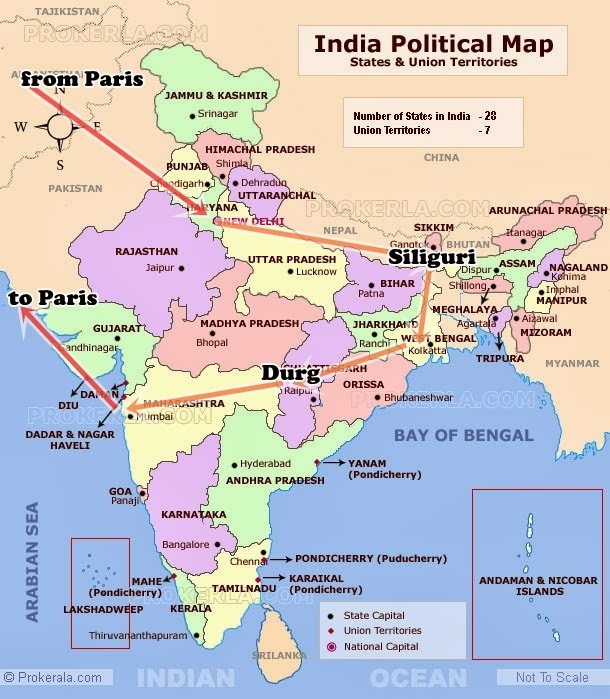 In between I am going to stop at Siliguri, Calcutta & Durg for sure. I am adding this map with pointers to give an idea.